After receiving her DVM from Michigan State University, Dr. Sarah Carter completed a one year rotating internship in Rhode Island with a focus on emergency medicine. 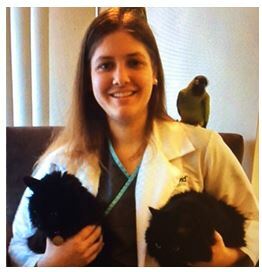 She’s had a lifelong passion working with, and caring for companion animals and exotic/pocket pets. Her interests stemmed at early age caring for her own pets, undergoing training to become a licensed veterinary technician, working as a technician primarily in emergency medicine, training and fostering assistance dogs, and voluntarily fundraising for Assistance Dogs of America and helping educate the public regarding working dogs and emergency medicine. Nowadays, Dr. Carter fulfills her passion working in general practice focused on preventative medicine. She is an active member of the AVMA and MVMA. At home, she tends to her two loving black long haired cats, Chowder and Vlad; her two birds Frank and Petrie; her king snake, Sace; and fresh water aquarium. On her down time, she enjoys spending time outdoors camping, sketching, listening to music, kayaking/boating, and playing disc golf.